If you liked Orange Creamsicles as a kid, try this Orange Creamsicle for adults! Easy to make, this creamy and smooth cocktail is simply delicious. • Add ice to a low-ball style cocktail glass. • Top with whipped cream. • To print the Orange Creamsicle Cocktail Recipe, click here. 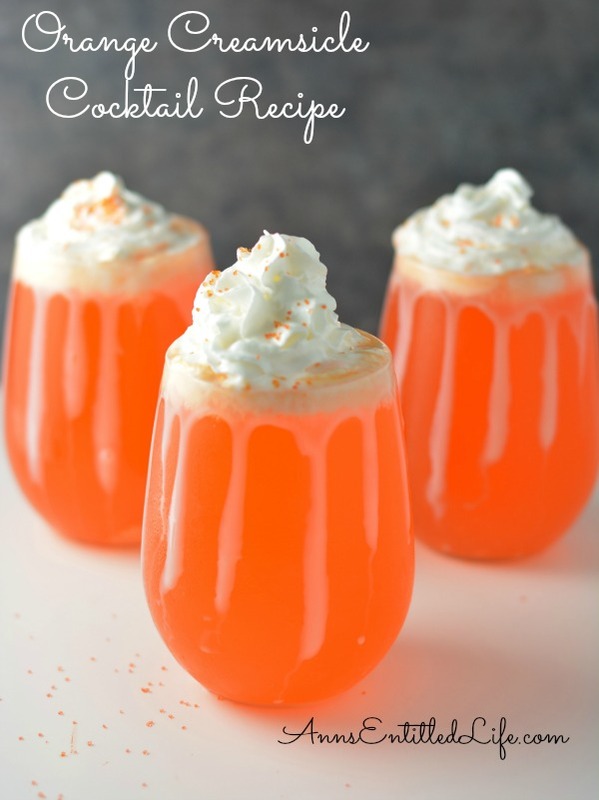 • For a little extra sweetness, you can rim the cocktail glass before you make the Orange Creamsicle Cocktail. Use the whipped cream vodka for the wet, and more sprinkles for the dry. 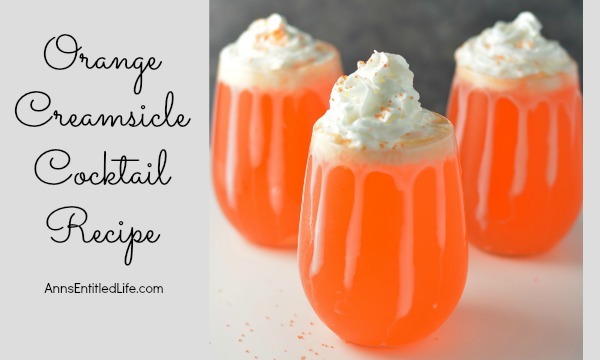 • Orange Creamsicle Jello Shots Recipe – Easy to make, this creamy and smooth gelatin shot recipe is simply delicious. This is an orange creamsicle in a Jello shot! 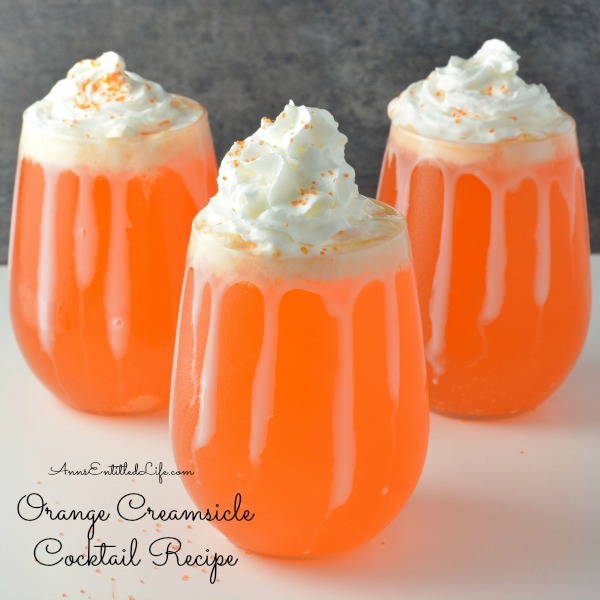 • Ma href=”https://www.annsentitledlife.com/wine-and-liquor/dreamsicle-cocktail-recipe/” target=”_blank”>Dreamsicle Cocktail Recipe – If you liked creamsicles as a kid, try this fruity update for adults. Simple to make, this luscious and tempting dreamsicle cocktail is truly heavenly. • High Tide Cocktail Recipe – The High Tide Cocktail will remind you of warm summer days and fun times on the beach. A sweet, delicious rum cocktail with a touch of Midori citrus, the high tide is a fabulous adult libation. I see whipped cream flavored Vodka not milk. And Sweet Condensed Milk. Thanks Kim, I fixed it. where do you get the whipped cream flavored vodka from ? Kathy, any liquor store in the US should carry it. If you have a state run liquor store, you may have to ask them about it. Yeah, but it’s fun to make things yourself. Even a non-alcoholic drink. My son made all of us shots first & we all loved them! OMG DELICIOUS! THEN HE MADE MY DAUGHTER -IN-LAW AN 8OZ GLASS EA. THEY WERE TO DIE FOR. AND THEY HAD NO SPRINKLES. I chugged it I didn’t sips it. Gives a little buzz on an empty stomach! I don’t recommend guzzling it should be sipped through a straw slowly & enjoyed. The straw also helps stir it as needed! It was wonderful!!! How much whipped cream flavored vodka do you add to the one drink? know each persons preference on how strong they want their drink. I would like to know how much you put in and go from there. where do you find whipped cream flavoured Vodka? i usedKamouraska Vodka, ice cream flavour, they didn’t have whipped cream. It is AMAZING!!! N I doubled the recipe for one drink! Karen – are you in Canada? i’ve made a variation of this before. I used heavy whipping cream instead of sweetened condensed milk and vanilla Stoli vodka!!! It’s very good. I am hoping there is a substitute I can use for the Vodka. I don’t drink, but this sounds so good. they still do! love them! Just use a good vanilla ice cream and cold orange soda, yep just like a rootbeerfloat !! I do an easy version. Just float 2scoops of vanilla ice cream in a glass of orange soda pop. Like a root beer float, only orange. Quick and easy! That sounds delicious! Thanks for the recipe. Pinning. Oh my! I’d love to try this! Thank you for sharing with us at Brag About It! OMG!! This looks heavenly!! I would love if you stopped by My place and shared your stuff on My 2 Favorite Things on Thursday – Link Party!! This looks absolutely amazing!! They do a ton of creamsicle crushes around us but these looks like the at home friendly version…and they look a little tastier, too!! Can’t wait to try these out!! What a great recipe! We have a Thursty Thursday party going on today and every Thursday on my blog. I would love it if you stopped by and linked up this recipe!! I know my readers would love it! Cheers!! I love orange creamsicles- what a great idea for a cocktail! Oh hello, I need this right now. Thanks for posting. Hello from Wonderful Wednesday. Don’t just hate it when some leaves whipped cream vodka at your house? Happens to me all the time. Oh, that looks SOOO good. I love orange creamsicle anything but this just takes it over the top! Try adding 1 oz Amaretto , even better. This looks great! With chocolate sprinkles it’d be the perfect Halloween cocktail. I’m going to try to low-carbify it and see what happens! GOOD IDEA CAILIN. WHEN I WAS A KID I WOULD “LOW-CARBIFY” MY CREAM CICLE THAT I BOUGHT AT THE STORE. I WOULD EAT THE ICE CREAM AND THEN THROW THE ‘ TWO MANY CARBS STICK ” IN THE TRASH. Sunday, Oct 11, 2015 @ 7 pm EST I am making your drink on our Virtual Laugh Bar show featured on Blab.im. I am going to give a shout out to you, your site and your drink concoction that I cannot wait to try on air. So if you see this message and want to tune in – The Virtual Laugh Bar. Can’t wait to try it! Yum Looks and sounds great! Thanks for linking up to Merry Monday! Pinned to my cocktail baord! Have a great week! Sounds like a perfect summer cocktail! I pinned this one! 🙂 Thanks for sharing! This tastes EXACTLY like an orange creamsicle, love it! This sounds like my kind of drink and those drips down the sides of the glass are perfect! My dad has always had a big heart for things that were orange cream because of the old orange dreams he grew up eating. Thanks for linking up with Delicious Dishes Recipe Party! When I put my zip in the vodka place no where near me has whipped cream vodka and I am crying because I want it. Now! I just made it. Taste great but not near as pretty as yours. My orange turned out like creamy orange. Still delicios. what a great idea, had no clue about whipped cream flavored vodka, so am happy to know that it exists, love the idea of this cocktail, and yes do have a great memory of Orange Creamsicles! Trying to find some summer-like cocktails to relieve winter-like boredom! Thank you!